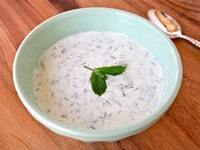 I made this Chilled Greek Yogurt Soup as part of our dairy menu Shavuot celebration yesterday. As I was pondering a first course for our holiday meal, I considered my soup options. The weather has been really hot here in Southern California, and the thought of tending a hot pot for a couple of hours didn’t really appeal. My mind drifted to cold soups like gazpacho and watermelon soup, but I wanted something that would fit better with the dairy theme of the holiday. 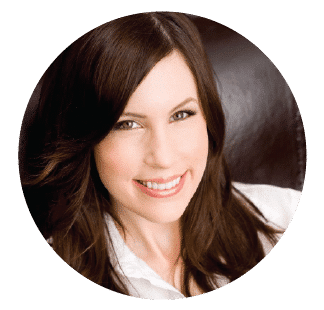 After browsing my rather extensive (scratch that– ginormous) cookbook collection, I came upon a couple of recipes that provided the inspiration I needed. More on that below. Cold yogurt soups are popular in the Middle East, particularly in Persian communities where yogurt is a major dietary staple. They are a great way to cool down in a heat wave; who can argue the simple brilliance of a no-cook soup? Some regions make a sweet version of yogurt soup, including aromatic elements like raisins and rose petals. I like the sweet soups, but I’m partial to the savory preparation I’m sharing here today. There is something about yogurt, dill, garlic and salt that is simply magical. I’m addicted to the combination. I adapted this recipe from Olive Trees and Honey, a vegetarian Jewish cookbook by Gil Marks. Claudia Roden has a similar, sweeter version in The Book of Middle Eastern Food. Claudia uses water and ice cubes to loosen the texture of the yogurt, which is the way it is done in many Persian communities. I prefer Gil’s method of using milk to achieve a proper soup texture, which enhances the creamy flavor without diluting or diminishing the potency of the yogurt. I took a departure from both Gil and Claudia’s preparations by using Greek yogurt instead of regular. This might seem counter-intuitive, since Greek yogurt is strained of it’s moisture– after all, this is a soup, and you need moisture to make it smoother and more soup-like. However, adding milk to the strained Greek yogurt resulted in a creamier, more luscious “broth” with a richness of flavor you just can’t get from plain yogurt. The resulting Chilled Greek Yogurt Soup was creamy, dreamy, and divine. The fresh herbs and garlic gave it a very Greek flavor… think tzatziki in soup form. If using whole milk yogurt it will be pretty rich, so serve smaller portions. This would also make a nice lunch or light dinner paired with a slice of whole grain toast and some smoked salmon. My family loved it. I hope you will too! 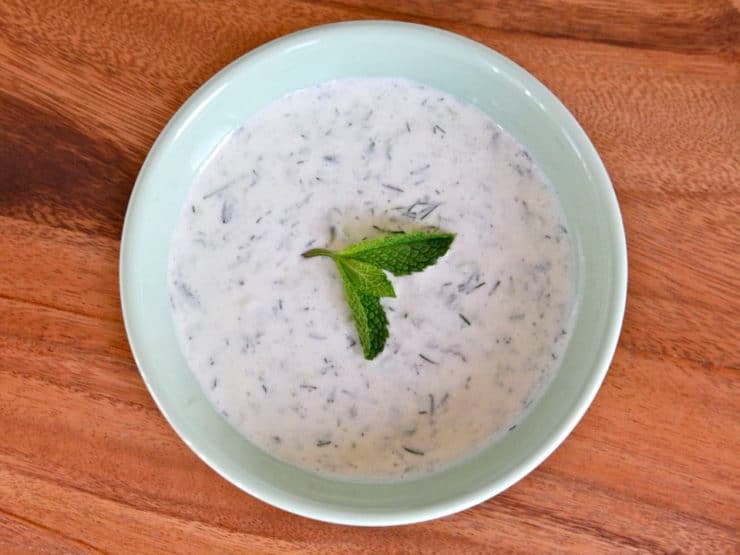 Simple no-cook chilled soup with Greek yogurt, cucumbers and fresh dill. Perfect for spring and summer, cool and refreshing. Kosher, Dairy. 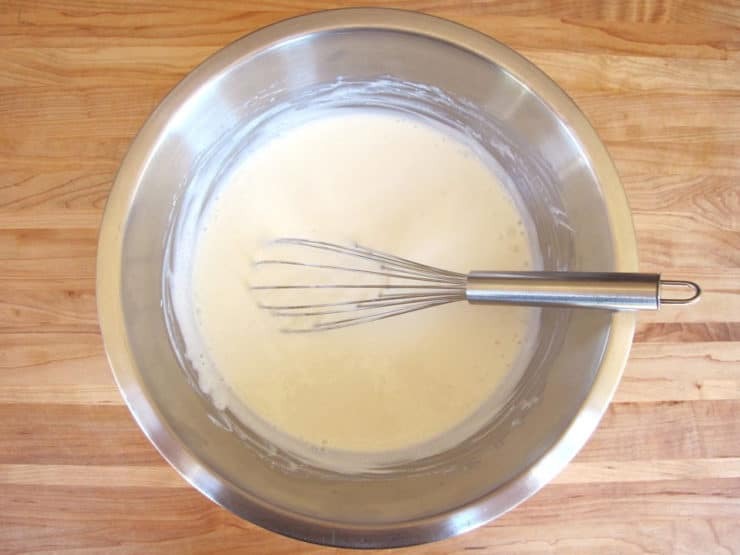 In a large bowl, whisk together Greek yogurt, extra virgin olive oil and milk. Start with 1 cup of milk then gradually continue adding more, whisking after each addition, till the yogurt takes on a soupy consistency. I stop adding milk when it reaches the texture of split pea soup. You can adjust the consistency according to your preference. 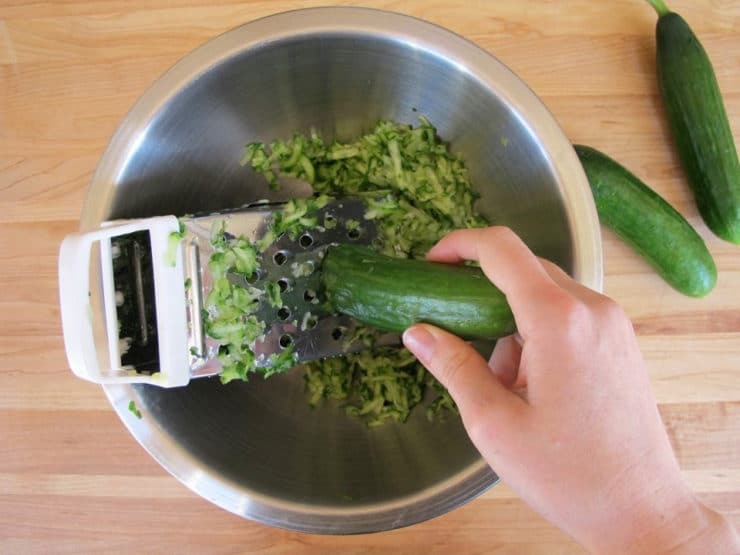 Grate the Persian cucumbers into a separate bowl. 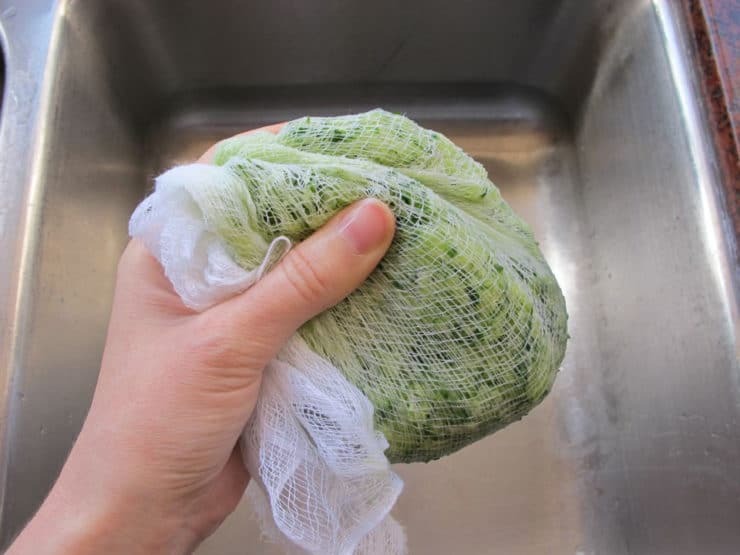 Wrap the cucumbers in cheesecloth or a clean tea towel and squeeze to remove excess moisture. Stir the cucumbers into the yogurt along with the dill, garlic, salt and white pepper. Adjust seasoning to taste. Place in the refrigerator to chill for at least 1 hour, up to 4 hours. Whisk the soup once more before serving, adding milk to loosen the texture if required and adjusting seasoning as needed. Ladle chilled soup into bowls. Top each serving with chopped mint or a mint sprig. Optionally, you can stir in a bit of fresh lemon juice to brighten the flavor, or top with chopped walnuts for a sweet and nutty crunch. Serve chilled. The sound of cold soup has never appealed to me. Ever. Until now. I will definitely have to try this. The hot, muggy, sultry days of summer in Alabama require this. I wonder, how do you think a bit of crushed, toasted sesame seeds or a bit of tahini mixed in would do? Compliment or ruin? I make this soup frequently, and I just love it. I use four garlic cloves. I can’t tell you how happy I am to have this recipe. Thank you! I looked for a recipe like this for a long time, remembering the cucumber yogurt soup from a lunch place off Columbus in San Francisco whenI was working on an editing project. Since my husband died in early March, this soup has sustained me. I’ve made it several times. I cannot thank you enough for this simple and sustaining recipe. 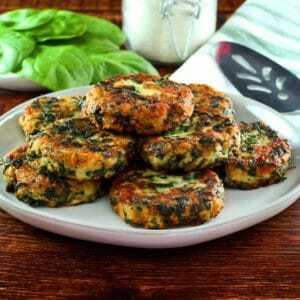 It is delicious and easy and nutritious. Fran I am so sorry to hear about your husband. Glad that this soup could bring you some nourishment and comfort during a difficult time. Loved it!! I only recommend not squeezing out the cucumber juice because it augments the flavor and really does not dilute. 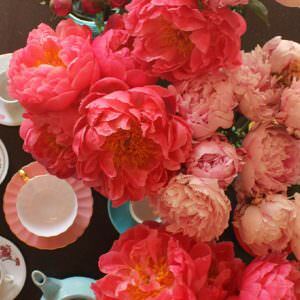 This is such a classic and a delightful summer recipe. I like to peel and seed a cucumber and either chop and add as garnish or puree and add to the soup for a more substantial texture. Miriam’s recipe is exactly what we had in the Borscht Belt (Catskill’s) except in the old days they used sour cream. I do not have the pickles, must run to the farmer! My Grandmother´s recipe for a Cold Borscht is also refreshing, but not quite as healthy. 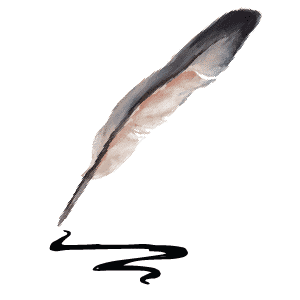 I will send it to you. Delicious. I am already eating mine. I used an English cucumber because that’s what I had on hand. Don’t forget that any liquid squeezed out from the cucumbers can be saved to add to a pitcher of ice water for an extra level of refreshment! That was fast Mae! So happy you’re enjoying it. It’s really an easy one to throw together, isn’t it? 🙂 Great tip about the cucumber water. Cool , refreshing and healthy. Sounds like it will be very refreshing on a hot summer day. We could swim in it we all love tzatziki, so yeah soup! I can almost taste it through the screen! Mmmm.